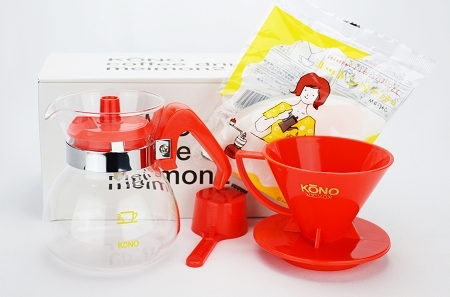 KONO Meimon Coffee Dripper Set, 1-2 person (cup) size, RED color only. Includes one MDN-21 Dripper cone, one Glass Carafe, and one pack MD-26C Cotton Paper filters (40 pc). Other filter papers sold separately. The KONO Dripper cone is widely used in Asia in Cafes, and homes, but often little known in other parts of the world! This dripper was developed in the very late 1960's by the Coffee Syphon Company in Tokyo, Japan, and refined, into its basic final form in 1973. It is distinguished by a large single opening in the bottom of the cone, similar to the Hario V60 (which it preceded), but with straight, and quite prominent internal ribs. The internal design of the cone makes for quite a different extraction approach than other filter cones on the market. The internal ribs are present in the bottom 1/3 of the cone, with the upper part of the cone wall completely smooth. This means that once the brewing volume inside the cone rises above the ribs, a hydraulic force is applied straight downward through the coffee bed, and once the brew volume is above the ribs, the addition of water to the slurry is quite forgiving compared to drippers wth fully ribbed internal sides. We used the KONO Dripper in the development of our 345 Pouring Pitcher. When paired with the KONO filters this dripper provides a platform for making a VERY good cup of coffee!